Tequila is big business these days. Consumers have been bitten by the agave bug, eagerly snapping up spendy bottles that fifty years ago would have been labeled “Mexican brandy.” While there are plenty of big brands (Jose Cuervo, Patrón, Sauza) and celebrity-backed brands (Carlos Santana and Casa Noble, Justin Timberlake and Sauza 901) clamoring for attention, there are also dozens of decades-old Mexican distilleries quietly (relatively speaking) producing top notch tequilas. One such brand that’s somewhat new to the U.S. market is Demetrio. While tequila has a reputation with some as Mexican firewater that requires lime and salt to choke down, it may surprise you that Mexico has extensive and comprehensive regulations regarding tequila and its parent category, mezcal. These regulations are known as NOMs (Norma Oficial Mexicana), and included among the regulations is that each licensed distillery receives a government assigned NOM number, present on any bottle produced. Multiple online NOM databases can help you dig deeper into your bottle’s background. It’s not at all uncommon for a distillery to produce multiple brands of tequila, which a NOM database search will clearly show, as you’ll soon see. Tequila is one of those spirits that has fought a long battle for respect from the casual drinker. All too often, people’s tequila perceptions are formed in some drunken college haze ending in an incident with vague memories of pressing their face to a cool tile floor, causing them to declare “I don’t do tequila.” Even if an early experience doesn’t cause people to keep a wide radius, there remains a wretched culture of tequila shots, the assumption being that tequila tastes so awful that it must be pounded with a lime and salt chaser. There’s even a blog and Instagram account devoted to tequila face. The truth is, artisanal tequila can hold its own with the world’s great spirits. The basics of tequila are simple: It’s made in Mexico using the heart of the agave plant, which is baked, crushed to extract the juices, which are then fermented prior to distillation. Per Mexican government regulations (known as NOMs), to be legally called tequila, the agave must be of the Weber Blue variety and the production must occur within the Jalisco region of Mexico, on the western coast of Mexico about 1300 miles south of the US border. Tequila is a subcategory of the broader category of mezcal, which I’ve writtenabout previously. The short synopsis of the difference between tequila and mezcal is that mezcal can be made with a wider variety of agave, and within a larger region within Mexico. So in short, all tequila is mezcal, but all mezcal is not tequila. The typical drinker’s perception of tequila starts and ends with Jose Cuervo. This and other low-end tequilas (known as “mixtos”) are required to be made from at least 51% agave, with the remainder coming from “neutral cane spirit,” essentially vodka. Slightly more advanced consumers drink Patron, which occupies the “high-end” tequila niche in most people’s minds. Beyond the heavy hitters in the tequila space– Jose Cuervo, Patron, Sauza–are quite a few smaller, artisanal producers who make topnotch, thoroughly enjoyable spirits, yet with a price point that’s a bargain compared to more trendy offerings like bourbon, scotch, and “premium” vodka. Dozens of smaller tequila brands, such as Corzo, Fortaleza, Casa Noble and Don Julio, are taking their share of shelf space, and the space is heating up with celebrity owners, two notable examples being George Clooney’s Casamigos and Sean “Diddy” Combs’s DeLeón. In this post I’ll take a look at the Partida line of tequilas, well-regarded by tequila aficionados. I received 50 ml samples bottles of the Blanco, Reposado, and Anejo bottlings for this review. Partida also offers an extra Anejo, but at $300 or more for a bottle, review samples are understandably scarce. The origin of the Partida line starts with Gary Shansby, a California native who made his fortune in marketing brands such as Famous Amos cookies, Mauna Loa macadamia nuts, and Vitamin Water. After these successes, he was looking to build a company from scratch that integrated his personal passion for Mexico. Around 2005 (dates differ depending on the source), he partnered with Sofia Partida, a California woman with family connections in Mexico. These connections include her uncle Enrique Partida, who farmed 5,000 acres of agave crop in Amatitan, southeast of the city of Tequila and northwest of Guadalajara. Sofia, an executive at Partida, functions as a global brand ambassador. Given the current interest in artisanal tequila, it’s surprising that Partida hasn’t been snapped up by one of the big liquor conglomerates like Diageo or Pernod Ricard, perhaps because Shansby isn’t looking for just another corporate payday. When selecting agave to harvest, Partida uses stock that’s reached at least seven years of age, letting the agave heart reach an optimal sweet flavor profile. The Partida Reposado and Anejo expressions are aged in once-used Jack Daniels American oak barrels. By sticking with one barrel supplier–and one with an enormous pipeline of stock–Partida can maintain its consistent taste profile. Shansby’s strong marketing background is evident in the bottle design: Rather than a standard cylinder or squared bottle, Partida’s rounded horseshoe shaped bottle (for lack of a better description) make the bottles distinctive and very easy to spot in a crowd. All three versions of the Partida come in at the typical 80 proof. The Blanco has a very pleasant nose that reminds me of creamed honey – I enjoyed it quite a while before sipping it. The initial sip has a very slight burn on entry, a nice mix of spices in the middle, and ends with a bit of pepper. Upon subsequent sips, I noticed a buttery, creamy note which I’ve experienced before in certain agricole rhums. Bryan Davis of Lost Spirits distillery tells me this is likely the presence of ethyl lactate, commonly found in distilled spirits. For comparison, I tried the Blanco side-by-side with Cabeza tequila, my normal go-to for a solid mixing blanco-style. The Cabeza is fruitier and has a tiny bit more burn, not surprising given that Cabeza is three percent higher in ABV. I found the Partida Blanco to be quite enjoyable by itself, but it would also be great in a Ti’ Punch-type drink, simply subbing the Blanco for the normal agricole rhum. Mrs. Wonk wasn’t as much a fan of the Blanco, calling it “too earthy” for her tastes. Next up is the Reposado. It also has a wonderful nose, although quite different from the Blanco. I get lovely spice notes, bringing to mind a great-smelling men’s aftershave. Tasting it, I found none of the creaminess that I get from the Blanco. Alongside the obvious agave notes is a hint of orange, bringing to mind a nice curacao. There’s very little burn, making it an excellent sipper. Placing the Partida Reposado side by side with Patrón Reposado, I found the Patrón to me much sweeter and less complex. In this regard, the Partida Reposado was the clear winner. Of the three Partida expressions, Mrs. Wonk and I agreed the Reposado was our favorite. It’s refined, but the interesting characteristics haven’t been smoothed away by the aging process. The Reposado would be outstanding in a tequila-based Old Fashioned (tequila, simply syrup, bitters). Finally, the Anejo. Somewhat surprisingly, the nose wasn’t a more intense version of the Reposado, and instead is closer to the Blanco’s nose. Tasting the Anejo, I found it to be very smooth and round, to be expected given the additional amount of aging, and there’s no burn to speak of. Unlike the Reposado, I didn’t taste the curacao note. Make no mistake, the Reposado and Anejo are very different animals. I also put the Anejo head-to-head with Corzo Anejo, one of my favorite sipping tequilas. The Corzo is more buttery (again, I’m guessing ethyl lactate) and also had cinnamon notes I didn’t perceive in the Partida Anejo. I’d happily enjoy a dram or two of the Partida Anejo neat so as to best enjoy all the flavors within. Pricewise, the Partida bottlings are within the range of other premium tequilas such as Patrón or Corzo. Checking online at my usual sources, the Blanco can be had for around US $37, the Reposado for around $42, and the Anejo for $49. If you have to choose just one, I’d recommend going with the Reposado as the best mix of bold flavors yet refined enough to enjoy drinking neat. A Summer Trip to Puebla – Strawberry, Spice and Tequila! A recent confluence of events has had me writing and thinking about fruit shrub, Ancho Reyes Chile licor, and tequila. It’s not a stretch to picture the three flavors together – Ancho Reyes and tequila come from Mexico, and at least here in the U.S., there’s a good chance your fruit did as well. If you’re not familiar with the relatively new Ancho Reyes, it’s essentially neutral cane spirits infused with chile. The genesis of the idea for my “A Summer Trip to Puebla” cocktail (Puebla is the town where Ancho Reyes originated) was my strawberry shrub, which I blogged about previously. While searching for the next great drink idea, I had the sudden recollection that the flavors of hot spices and strawberries go well together, and that Ancho Reyes provides a nice amount of warm spice without setting your mouth on fire or rendering you prostrate. The vinegar and sugar in the strawberry shrub do a fine job of providing the sweet and sour elements that make up so many cocktail patterns. But a cocktail with just Ancho Reyes and strawberry shrub alone is too intense for most folks. Plus, to get to the typical 2 oz of 80 proof spirit in a drink would mean 2 oz of Ancho Reyes, which is a large volume of spice. What I needed was something that would contribute to overall alcohol content, while letting me use a more moderate amount of Ancho Reyes – augmenting the chile flavor but not competing with it. A quick scan of my bar bottles and the choice was obvious – A blanco tequila, rich with its own floral notes, and also a good companion to spicy heat. I used Cabeza, a fine mixing tequila from the 86 Company. Build in lowball glass, fill with crushed ice and stir to mix. Garnish with mint leaves or other fitting garnish. Author Matt PietrekPosted on August 11, 2014 November 27, 2015 Categories cocktail recipes, tequilaTags Ancho ReyesLeave a comment on A Summer Trip to Puebla – Strawberry, Spice and Tequila! Mezcal is one of those spirits like smoky Islay Scotch that evokes strong opinions from anyone who’s tried it. It has bold flavor, and like Islay Whisky, the most common description that comes to mind is “smokey.” Beyond that, however, the tastes are very different. I’ve dabbled in mezcal for a while, but recently attended a Northwest Tequila Fest session here in Seattle, where I gained a whole new level of understanding and enthusiasm for mezcal. Here are some highlights and takeaways from the event, including why mezcal is among the best values in spirits today, despite its relatively higher price. The weather here in Seattle today was outstanding – May 1st and 80+ degrees. It seems like everybody’s out soaking up the weather we don’t normally get till July. I haven’t been doing a whole lot of original riffing on cocktails lately – mostly sticking to tried and true recipes so I’ve started to get the itch to be creative again. Normally on a beautiful day, tiki or tropical drinks (rum, lime, etc…) are my go-tos. However I’ve had a lot of tiki lately and I do tiki year-round, and I feel a need to break out a bit from my rum-rut. My other fallback for this sort of weather is tequila drinks, e.g. margaritas with a twist, but something in that vein didn’t feel very ambitious. However, I’ve not had much tequila recently so I had a strong preference for using tequila as a base spirit. As I often do in situations like this, I start mentally scanning my bar ingredients looking for flavor combinations that might pair well. Tequila, like rum, has a natural affinity for lime, but how not to fall into the margarita trap? What about cherry? Cherry and lime go well together, and I have several cherry liqueurs including Cherry Heering in my bar. Thinking through my options, Cherry Marnier seemed more summery to me than the Heering or the exotic liqueur we muled back from a trip to Turkey a few years back. At this point I had a solid start but felt like it was still a bit too simple. I was also thinking about amaro drinks like the Americano. 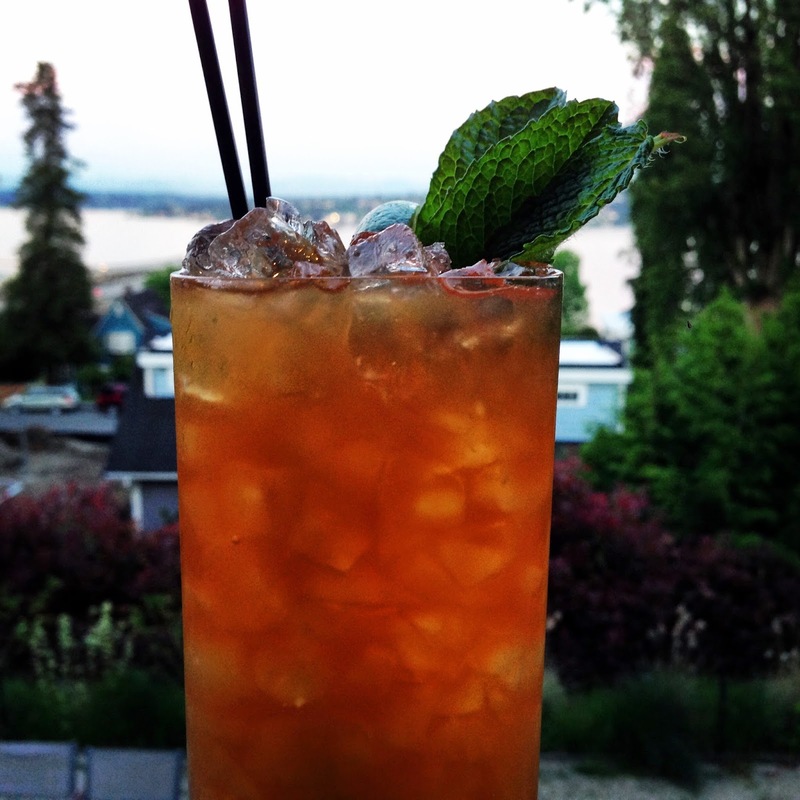 Cherry and lime are strong flavors, so I need something that could stand up to them, like say… Fernet Branca! In reasonable doses Fernet Branca t gives a nice minty aspect to drinks. I’ve even seen it work well in tiki drinks, thanks to my friend Connor O’Brien during his tenure at Rumba. Combine all ingredients in a Collins style glass. mix well and fill with crushed ice. For garnish I used a lime slice and some mint springs.